Due to the generosity of the American Association of University Women, Camden County Branch, 16 students, parents and staff from the CamdenForward School attended the Philadelphia Orchestra Family Concert on Saturday, March 27, 2010. The program began with a “Pre-Concert Adventure” in the Perelman Center which explored rhythm and beat in music. The children learned how music and mathematics are linked when composers write music. It was a fun and interactive experience. Next, we rode the glass elevator to the Roof Garden. The children enjoyed the views of the city and the lobby far below. The highlight of the morning was the Fabulous Philadelphians presenting excerpts from Stravinsky’s The Firebird in Verizon Hall. The orchestra was joined by actors from the Enchantment Theatre Company, who skillfully portrayed this Russian folk story. Colorful costumes and larger than life puppets, along with the wonderful score, succeeded in engaging the audience. This was the 42nd year for the American Association of University Women, Camden County Branch, to do this good work. UrbanPromise is grateful to this organization for providing this opportunity for our children. For the last four months six students who attend UrbanPromise AfterSchool Program in South Camden along with four mentors having been building two, full scale replicas of the sleds used by North Polo explorers Matthew Henson and Robert Perry to reach the North Pole. On March 27, 2010, the students will hitch their sleds to a team of seven dogs at Cooper River and "mush" the dogs on the grass. Click here to read the article in the Courier Post. Click here to view news coverage on NBC 10. PHILADELPHIA — During a recent tour of the Picasso exhibit at the Philadelphia Museum of Art, museum educator Diane Marimow quizzed the dozen third- and fourth-grade students from UrbanPromise's CamdenForward School. She asked why the colors in the shapes in Picasso's cubism painting of the "Man with a Violin" were not very different. Many hands shot into the air. She called on Rene Cruz, a third-grader, who said, "so nothing stands out." "What you just told me is the definition of cubism," Marimow said with excitement in her voice well beyond the typical museum whisper to the enthralled students. At the end of the 80-minute tour, Marimow complimented the students on how "they knew so much before they even walked in" to the museum. She said they were like Picasso, who learned something new and tried new things into his 90s. "That really helps," Marimow said. "I used to be an art teacher and I wouldn't take my students to a museum unless they had some preliminary experience. They were able to look at cubism with a trained eye." The students at UrbanPromise's CamdenForward School knew so much about Pablo Picasso because for weeks they had been studying his theories in art classes. UrbanPromise art teachers Karen Baker and Julie Kring-Schreifels taught the students his ground-breaking concepts and the history behind his revolutionary style, and they asked the students to paint and draw like Picasso. "I like Picasso. He is an inspiration to me," said Rene, who is 8 years old. "He was an inspiration to his friends, too, like Georges Braque." Rene not only knew of Picasso but also of the less popular Braque, a French painter who helped develop cubism. "It is not just about creating," said Baker. "We bring in history and they learn about culture." The first painting the children of UrbanPromise saw at the museum was the 1906 self-portrait of Picasso when he was 25 years old. "Picasso's work inspires everybody," said Julio Rivera, a third-grader. "The reason we knew the right answers is they taught us all this." The last work the students saw was Picasso's "Man with a Lamb" sculpture, created during World War II when Paris was being bombed. Marimow asked how they saw the sculpture, and Rene said, "it looks like France went through a lot of troubles." The students went back to the classroom after the trip to work on their masterpieces at the newly renovated art studio on the UrbanPromise campus in East Camden. Rene said the trip to the museum made him want to paint now even more. "I want my job to be a painter," Rene said. "He inspires me." View more pictures http://www.courierpostonline.com/article/20100315/NEWS01/3150318/-1/newsfront2/Students-aid-UrbanPromise-kids CAMDEN — Jacob Hill had a choice of spending spring break doing community service in one of New Jersey's poorest urban cities or vacationing with his college classmates in Panama. The 18-year-old West Virginia man passed up a chance to party in Panama City, which has a vibrant nightlife. "I figured this would be a better use of my time," said Hill, a freshman athletic training major at Alderson-Broaddus College in West Virginia. "It's a lot of fun. You can do good work in a community that needs it," said the Clarksburg, W.Va., resident. He is among more than 300 college students who will spend a week participating in a spring break program in Camden overseen by UrbanPromise Ministries, a nonprofit Christian-based organization in the city. The first group arrived in late February and the last group will leave in mid-May. Students interviewed said they were able to afford the trip by holding fundraisers, tapping their own savingsor getting financial assistance from their parents. Calvary Baptist Church College Group, based in Kentucky, had the most student participants with 35. Also represented were large schools such as The College of William & Mary in Virginia and Pepperdine University in California and smaller institutions such as Bowdoin College and Bates College, both in Maine, and Dordt College in Iowa. The College of New Jersey in Ewing, the only New Jersey school to participate, sent 11 students. Each work group spends their morning in community service projects, mostly, but not entirely, on the UrbanPromise main campus at 3700 Rudderow Avenue. "We rely on these students who do the everyday maintenance that you would expect would be needed," said Jim Cummings, director of the WorkGroup Program for UrbanPromise. "Even if you paid these students at minimum wage, you could easily figure that it comes to thousands of dollars to the ministry to offset the cost of maintenance, allowing us to work with the kids," he said. UrbanPromise operates two schools for K-12 students, after-school and fine arts programs, summer camp and offers training for older teens who can serve as counselors, coaches and mentors for younger children. There are seven buildings -- from new construction to aging facilities -- on the main campus and all are in need of maintenance, especially following an unusually harsh winter, Cummings said. The college work groups will help with refurbishing one of its after-school programs, doing mostly demolition work: tearing down ceilings and ripping up old tiles. UrbanPromise has cut back on full use of the site -- even limiting enrollment -- while renovations continue. Once temperatures rise, work groups will do landscaping work, prepare a butterfly garden, wash and clean UrbanPromise's vehicle fleet, clean out gutters and paint trim on buildings. In the afternoon, all groups assist with UrbanPromise's after-school program, helping children with homework and supervising recreational activities. They officiated and judged the annual Spring Olympics, which puts children from different parts of the city on the same team and pits them against each other in friendly competition. Drew Domitrovits, 20, of Haymarket, Va., who made the five-hour drive to Camden from The College of William & Mary in Williamsburg, Va., said the Olympics helped unify children from different parts of the city. Domitrovits, a junior majoring in international relations, said he volunteered so he could experience an unfamiliar place. "The environment I live in all the time is completely different than it is here. It's really good to get insight of what it's like living in other places," he said. The trip is proving to be educational for Domitrovits, who is finding that there are a multitude of potential solutions for urban problems. For example, many problems can be traced back to a lack of access to quality education in public schools, he said. In order to make a difference, Domitrovits believes there needs to be a shift in individual attitudes and the overall culture and community programs must provide positive role models. Cummings said he has deep respect for students who sacrificed their spring break in the service of others. He recalled using college spring break to indulge himself. "I'm inspired to meet young people of this generation so committed to serving and learning. It gives you a great sense of hope and future. In a city like Camden, these signs of hope and inspiration are so necessary," Cummings said. Thank you to everyone that came out from the community to support the youth from UrbanPromise that participated this past Friday night at Treehouse Coffee Shop. We are so proud of our youth for sharing their gifts with the community. I think sometimes we get really caught up in how great we think we are. I’m not necessarily referring to the overt pride that we can have (though that also does apply here), but to the subconscious way it’s easy for those of us from wealthy, educated and loving communities to feel like we have something to offer those “less fortunate” than us. We want to do something about the suffering we read about, and we try to accomplish short-term goals that we’ve created from our own will. But sometimes—actually, almost all of the time—all God asks us to do is show up. I came here to Camden with a group of nearly 20 Pepperdine students on spring break, and I must admit, we were not all initially in the best state of mind about this trip. Service is one thing, but service andfreezing cold weather? That’s another animal. Warm weather, beach and relaxation are what most college students look for on their spring break, and I think it’s fair to say that after months of writing papers, studying and taking exams, it’s perfectly justified. One girl from our team, Ashley, said she and her roommates went shopping before they left for their respective trips and while they tried on new bikinis, Ashley scoured the stores for a few pairs of warm wool socks. It’s a bit of a silly example, but it really sheds light on trading one type of week for another—swimsuits, sunglasses, and rest for boots, coats, and some serious hard work. Regardless of our small degree of hesitation, on February 27 we all packed our bags, hopped on a plane, and showed up. From the moment we started our journey from LA to Philadelphia, the Lord began to prepare us with patience. Elena sat next to two small, crying children; Maddie and Bri endured loud snores from the man in the aisle seat next to them; Heather, Dave and I spent over an hour searching for parking in downtown Philly before finally deciding to divide and conquer, paying almost $20 for one spot, and parking blocks away for another. But despite the obstacles, each hour and each patience-trying event seemed to bring us more united as a team and prepare us more for the week of work ahead. In our week here working with UrbanPromise, we have torn up old tile, ripped out a ceiling, facilitated classes, shoveled truckloads of snow, picked up trash on the side of the road, played games at after-school programs, and helped kids with their homework. That’s a lot of stuff—a lot more than any of our vacationing friends have done this week—and it would be easy to give ourselves a pat on the back, feel some sense of accomplishment, and act like we offered something special to this community. But if that’s our attitude, then our work is in vain and worth nothing. I’ve been beautifully reminded this week of what it means to truly relate, and to show love to someone when they’re seemingly unlovable—the kind of love that our Savior shows us. “Very rarely will anyone die for a righteous man, though for a good man someone might possibly dare to die. But God demonstrates his own love for us in this: While we were still sinners, Christ died for us” (Romans 5:7-9). At the end of the day, we have nothing to bring to this broken community but our broken selves. We are all, as the pastor of Epiphany Fellowship in Philadelphia said on Sunday morning, “Raggedy.” Every single one of us. We are all “wretched, pitiful, poor, blind and naked” (Revelation 3:17), but we are also all redeemed, understood and loved by the only One who knows exactly who we are underneath all of our appearances. I am just one human relating to another, serving another, loving another. Sure, my brokenness is certainly different than someone else’s—especially a kid from Camden—but it doesn’t change the fact that we share the commonality of the human experience. I cannot offer anything except the willingness to serve this community through making myself available to be used. Check out the piece NBC 10 did on our dog sled project! 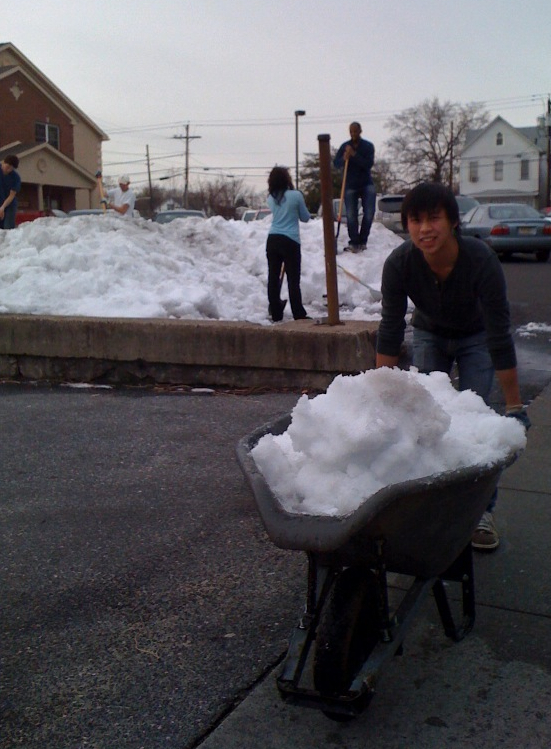 Pepperdine University students help clear mountain of snow in UrbanPromise parking lot today. Camden, NJ Monday, March 1, 2010: This Monday at 12:40pm, a group of 3rd-5th graders from UrbanPromise will walk the halls of the Philadelphia Art Museum and get to experience an exhibit of artworks that shook the art world nearly a hundred years ago, and continues to influence contemporary artists today. Picasso and the Avant Garde in Paris, which opened this week at the Philadelphia Museum of Art, is an extensive look at Cubism in its many forms. Third, fourth and fifth grade students at UrbanPromise’s CamdenForward School have begun to explore the theories of Picasso and fellow artist, Georges Braque in art lessons that focus on still life and portraiture. Art teachers Karen Baker and Julie Kring-Schreifels are thrilled to be able to offer students this opportunity to come face to face with these compelling works. The trip is offered through a grant from the museum and the non-profit, Art Aware, that supports the arts in Camden Schools. Students from UrbanPromise will venture later this month to a presentation of Stravinsky’s The Firebird at the Kimmel Center and in April, The Lion King at The Academy of Music. Barbara Pfeiffer, founder and director of Art Aware has long taught and promoted arts education throughout Camden schools. And the students are creating some masterpieces themselves in their own, newly renovated art studio on the UrbanPromise campus in Camden. On any given day students of all ages are working on paintings, sculptures, printmaking or batiks inspired by artists whose work speaks across the ages and cultural barriers. From self-taught, rural Idaho artist, James Castle, to Philadelphia native portrait artist, Barclay Hendricks, and now Picasso and Braque, UrbanPromise students are truly becoming “art aware”.